I’m Jenny Goodwine. If you don’t know me yet, it’s no wonder: I’m new ’round these parts. In fact, I pulled into Seattle’s King Street Station just over a month ago, after leaving my hometown of Champaign, Illinois with my one-way Amtrak ticket in hand and a single backpack in tow. My destination? 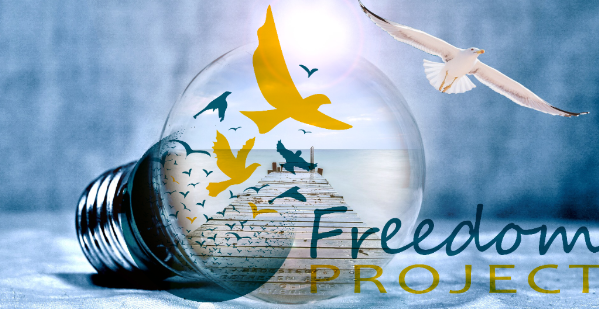 Freedom Project – to contribute what I could and to learn as I am able, as their new intern. Well, you first need to understand the deep resonance I have with Nonviolent Communication – and the profound need I have to contribute meaningfully toward peace in the world. It felt like a pretty natural move. I remember two Octobers ago, first grabbing Marshall’s book, Nonviolent Communication: A Language of Life off the bookshelf of someone I was dating at the time. I’d never heard of the book before, and I picked it up without much thought; I just wanted something quick to read while I waited for a friend. An hour later, I was only on page 17, with tears welling in my eyes and a big resounding YES in my chest. The book spoke to me so much that, the moment I finished the last page, I jumped to the computer to figure out how soon I could quit my social work job to become a paid, certified trainer in Nonviolent Communication. What I did find, though, were these events called International Intensive Trainings for Nonviolent Communication. After very little deliberation and a strong inner sense of, “Why not live the life I want right now?” I quit my social work job. My first line of business? To head to Albuquerque, New Mexico for a nine-day International Intensive Training for Nonviolent Communication. Needless to say, the experience left me feeling inspired, eager, and thirsty for more. All throughout those nine days, I kept asking folks, “How can I do this more? Like, all the time?” The words “Freedom Project” popped up here and there that week, uttered by more than one mouth. I made note. Months later, after enjoying some time at intentional communities, a two-week long bike ride, workshops, and a healthy dosing of inner reflection (a.k.a. being jobless), I found myself on the phone with Sue McCarthy at the Freedom Project, talking internship. I told her that I see the face of a man I met on my first visit to Monroe; someone who is currently incarcerated there. He came up to me after that two-day workshop in August, a little bashful, to shake my hand. “Jenny, I just wanted to let you know, I’m not this rough face. That’s not me. I’m not my crime,” he said, pointing to his face. I feel so grateful that he came up to me that day. I feel so grateful to be working with an organization that supports this man’s sentiment so deeply. To me, Freedom Project is equipping people with the skills to see the Good within themselves; and from there, seeing the very same Good within others. I look forward to meeting you all in person. Thanks for making life more wonderful.